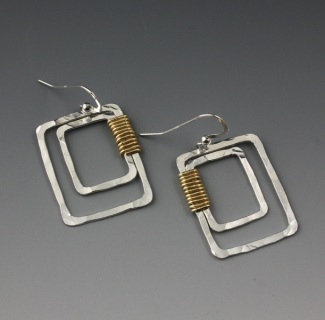 I'm excited to offer my jewelry for purchase online! 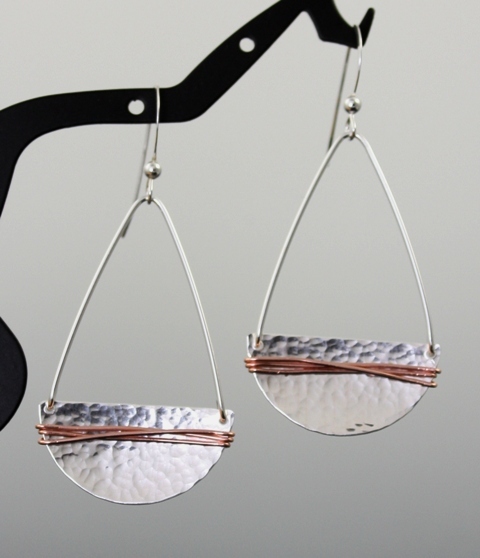 Each piece is individually handmade by me and no two are exactly alike so small variations in size, length, width, and color are to be expected. 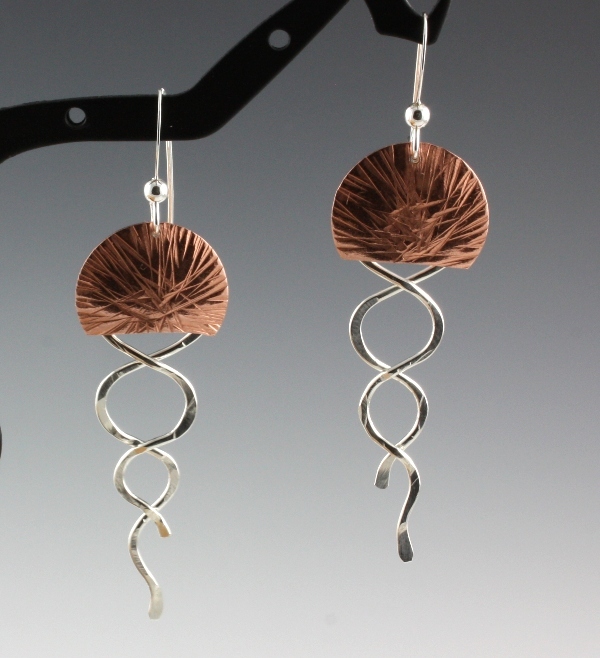 These variations in the character of each piece are what gives handmade items their true uniqueness! Purchase details are at the bottom of the page...please read before purchasing. 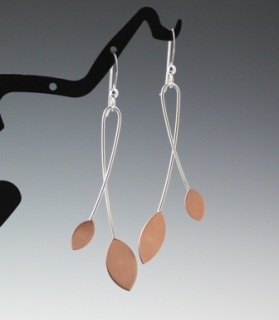 I hope you enjoy browsing my shop and happy shopping! 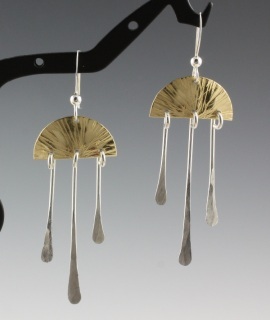 I love to combine different metals in a single design. 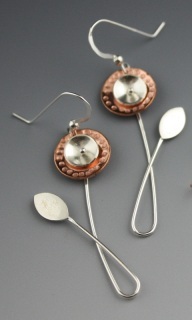 The earrings listed here are sterling silver, copper, brass, and/or gold-filled. All earrings have sterling silver earwires. Sizes listed are approximate as each pair turns out a little differently. 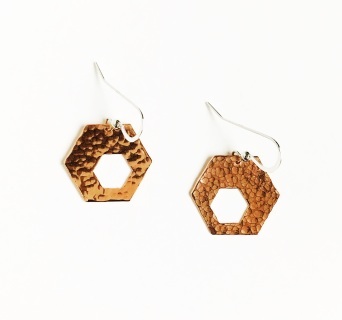 Hammer-textured copper hexagons featuring small hexagon cutout. 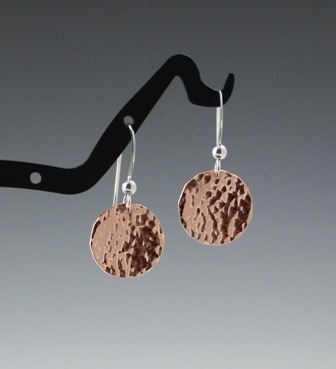 Inspired by Northern Ireland's Giant's Causeway. Approx 7/8" long. My first tri-tone earrings! 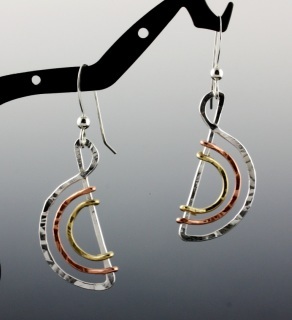 Half-circles of brass and copper nestle inside the larger sterling silver arc. 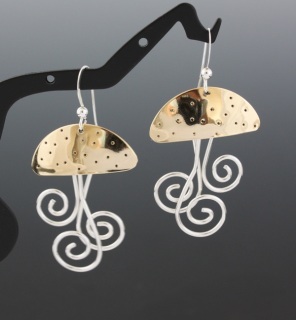 These 'happy' earrings remind me of rainbows, watermelon slices, smiles, and maybe something musical. 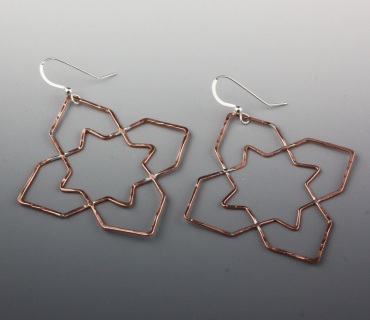 Inspired by the geometric patterns found in beautiful Moorish tile work of Southern Spain. This star within a cross was my favorite! Sterling silver wires with brushed copper leaves, approx 2" long. 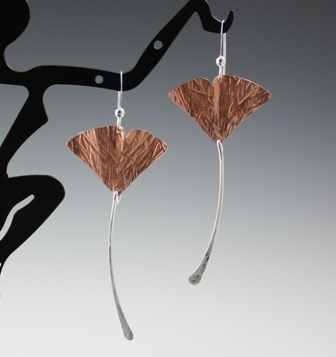 The copper leaves are laqcuered on the front so the color will remain intact until the lacquer wears off. Sterling silver earwires and a 5/8" copper disc with a beautifully hammered texture. 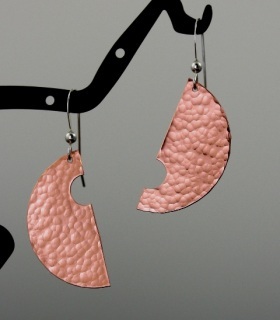 Disc is shiny at first, but is unlacquered and will patina (darken) naturally. Copper gingko leaves with graceful sterling silver stems that sway gently as you wear them. Approx 2 1/4" long. The copper leaves are lacquered so the color will remain intact until the lacquer wears off. Two hammered texture sterling silver rectangles wrapped by golden brass wire. 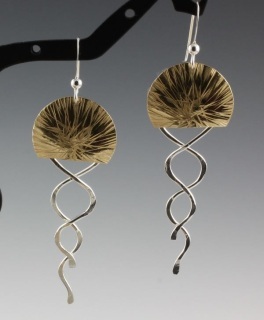 Love the gold/silver contrast! Approx 1 1/4" long. A delve into asymmetrical designs! These copper and sterling silver earrings each have the same shape, size, and hammered texture, but the small half circle cutout detail is placed differently. A unique effect! Approx 1 1/8" long. 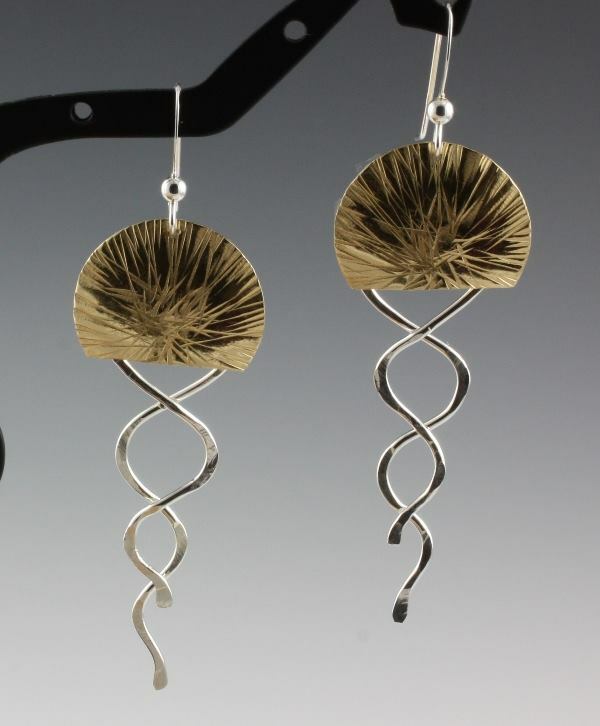 A delve into asymmetrical designs! 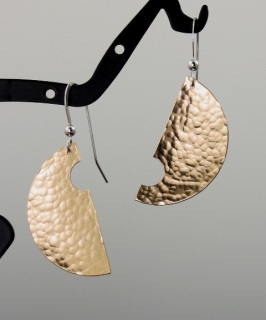 These brass and sterling silver earrings each have the same shape, size, and hammered texture, but the small half circle cutout detail is placed differently. A unique effect! Approx 1 1/8" long. Based on the chrysaora colorata, also known as the 'purple striped jellyfish', this design features sunburst-textured brass for the jellyfish bell and gleaming sterling silver arms. The arms swing freely for extra movement. Approx 1 7/8" long. 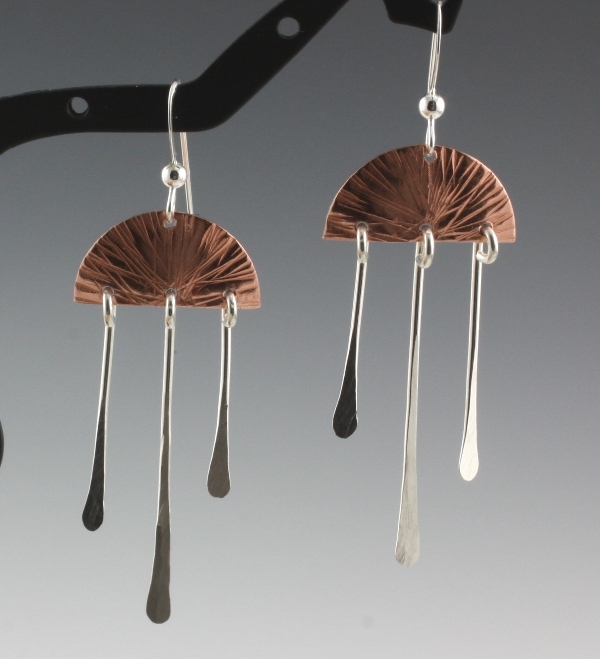 Based on the chrysaora colorata, also known as the purple-striped jellyfish, these earrings feature sunburst-texture copper as the bell of the jellyfish and gleaming sterling silver arms. The arms swing freely for extra movment. Approx 1 7/8" long. I generally ship within 5-7 business days. If there will be a delay, I will send an email. Please make sure your PayPal email and mailing address information is up to date. All items are shipped in a pretty organza gift bag, wrapped by extra padding, and placed into a padded envelope. I ship USPS first class with delivery confirmation. If you need an item sooner or would like insurance or have any questions, please contact me directly for info and any add'l charges before purchase. Prices listed do not include shipping....shipping is added at checkout. If you are a WA state resident, sales tax will be added at checkout. When you are ready for payment, you will be directed to Paypal for secure payment, but rest assured, you do not have to have a PayPal account to use a credit card. If you would like to pay by check, contact me directly, do not use PayPal. Items purchased will sent after confirmation of check clearance. I hope that answers any questions but if there is a topic not covered, please feel free to contact me anytime.